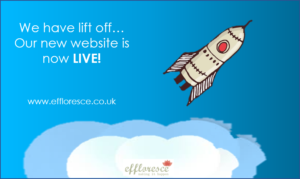 We are proud to share some exciting news with you as we head into Year 4 at effloresce. Our new website is live and we couldn’t be more excited! The site and content will of course evolve over time, as we learn and continue to adapt to our customer needs. We already have a list of developments we want to make, the most important being a section about HOW we have specifically helped each of our clients grow, but for now its live and we are very happy about that! We have been on quite a journey in the past 4 years. In true effloresce “honest and transparent” style, we continue to learn and we are very lucky to work with some truly inspirational clients from an eclectic mix of businesses; we support start-ups and entrepreneurs, small local businesses, National corporates and even one man bands – and we love working with each and every one of them. No matter the size of a business, we all want the same thing; to move forwards and enjoy doing so. We help companies, whatever their size, grow through a variety of marketing strategies and tactics. We know what we need to do to get results and we have proved this time and time again with our clients, past and present. We get it and invest our time in getting to know your customer, you and your vision. The key thing for us as a business is that we are not a consultancy, nor are we a marketing agency, we are an experienced team of outsourced professionals who will join your business for as long as you need us. With all our clients, we work as part of their team, mostly virtually but we are equally as happy to immerse ourselves at your offices – whatever it takes, we will be there with you on your development journey. With us being outsourced, you simply pay for our expertise, no overheads – which allows us all to focus on the job in hand. We are proud of the fact that the majority of our retained clients have been with us from the beginning. For us it is all about building relationships for the long term. Invest in us and we will most certainly invest in you. Who would have thought that just two years after we founded effloresce back in 2015, that we would now be a team of 6 (and we are recruiting now so you please do drop us a line if you would like to join us!). We are proud of our team and the variety of skills they bring to the table. We all share the same values which we believe is the most important thing of all. Customer centricity, honesty, transparency, flexibility and a work hard-play hard ethic – this is what matters to us and our team certainly share the effloresce ethos. This new website was born directly out of our learnings as a young company, but also out of feedback we received from our team, our clients and our suppliers. We undertook our very own Brand Health Check and created a list of key questions to ask with regards to our positioning, our branding and our offering. We are proud to say that 100% of those interviewed said they would recommend working with us and there was also some constructive feedback from fellow business people who were good enough to nurture effloresce. We love to learn and this relates to ourselves too. ; we don’t know what we don’t know and if we don’t, we will sure enough find out! So here is to Year 4 and helping many more clients “burst forth and bloom” – we look forward to meeting you.